The natural history of the Galapagos Islands has fascinated visitors since their most famous guest landed there in 1845. Darwin's observations during his voyage on the HMS Beagle laid the foundation for a theory that greatly impacted western thought --the theory of evolution. Upon rediscovery of the islands, your mind will also reel with delight --leaving you slack-jawed with awe, your camera flashing. Amid the volcanic geography of these islands 600 miles in the Pacific Ocean, plant life takes root in basalt rock, centurion turtles roam and penguins swim in equatorial waters. In the 450 years of human history, the islands have been used as prison colonies, naval ports and research stations. Come with us and discover an undiscovered land in the geology of the Galapagos Islands, a unique spot of the earth with an environment nearly untouched by man. Galapagos Visited by the Incas? While there has been some speculation that the Incan culture made an early visit to the Islands in the 1400, many historians attribute the possible journey of the Inca Tupac Yupanqui to the Easter Islands, and lacking documentation, this theory is widely dismissed. Fray Tomas de Berlanga, the Bishop of Panama documented the officially first visit to the islands in 1535. Delegated to investigate the accounts of the barbaric actions of the conquistadors in what is now Peru, his ship, caught in a dead calm, drifted westward in the ocean currents. With water sources depleted, the Bishop and crew searched the new islands for fresh water, almost entirely in vain. Frustrated, and suffering, the men resorted to crewing the native cactus for water. 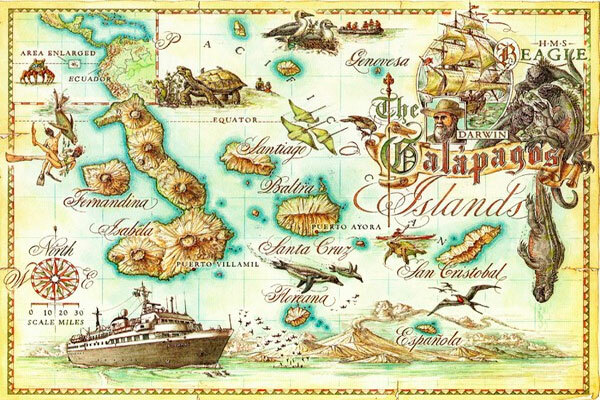 Disenchanted, they left the islands, but not without sending word to King Carlos V of Spain, telling of the strange and foolishly tame wildlife and the numerous galapagos (giant tortoises), and the name stuck. The islands appeared on the map late in the 16th century as the "Insulae de los Galopegos". Also motivated by the conquistadors on the continent, another group of lost sailors dubbed the islands with another name. In 1546, a group of insubordinate soldiers of Pizzaro attempted what might have been South America's first coup d'etat. Vanquished and exiled from the continent, the upstarts had little to no nautical training and were taken, much like other animals that were also transported there, by the currents until they came in sight of the Galapagos. With their limited maritime skills, the ruffians attempted to arrive at the islands by sight. Peering through fog and carried by currents, they felt as though the islands themselves were moving, that they were enchanted and named them "Las Islas Encantadas." Not all visitors to the Galapagos arrived by accident. Many used the islands into way station and ports of call. During the long hostility between the English Navy and the Spanish Armada, English gave a sort of support to the buccaneers who sacked Latin American ports and seized galleons by not persecuting them. These pirates used the uninhabited islands as base and refuge after raids. Establishing ports (such as Buccaneer Cove at Santiago Island), they found the islands useful for gaining occasional fresh water and stocking up on fresh food. 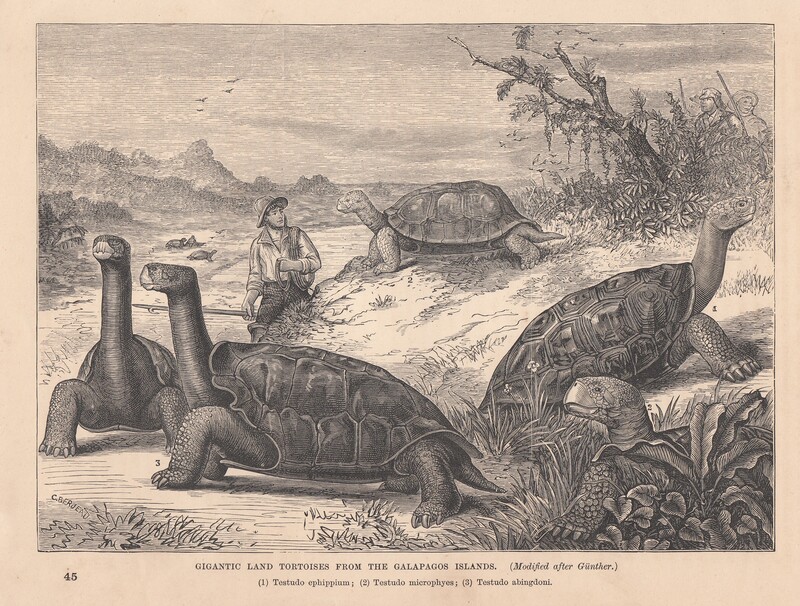 Upon discovering that the giant tortoises could be stacked upside down and live for up to a year without food, many passing ships went ashore to gather the fearless animals for meat during voyages. One English buccaneer, William Ambrose Cowley, drew up the first basic navigational charts in 1684. Like other buccaneers, he named many of the islands with the names of English royalty - James, Albemarle, etc. Over the years, divers have occasionally found evidence of buccaneers on the Galapagos, such as large jars found. Dive and you might discover a galleon's precious coffers! The buccaneers were not the only to use the islands as bases for operations. In the 1800's, as South America became increasingly independent of Spanish rule and open to trading, mercantile vessels such as whaling ships came to the islands, especially Floreana. Hunting the populations of sperm whales in the South American seas, the whalers had lasting effects upon the islands that are still apparent today: the reduction of elephant tortoises, the near extinction of sperm whales and the unofficial Barrel Post Office on Floreana.